Life happens, every single day; it is never too soon to protect yourself and the ones that you love. Estate planning isn’t just for after-death wishes. It is also to keep you in control while you are still here. For example, parents with adult children no longer have automatic rights to access their children’s medical records or make legal decisions on their behalf. For Sylvia, the thought of being incapacitated is difficult enough to fathom. Not knowing who might have the final say in case of her own emergency was enough to motivate Sylvia to learn more about estate planning. She soon realized the importance of proper planning and retaining control of critical aspects of her own life, educating young adults on this topic became a passion for her. Naturally, peace of mind is an invaluable benefit of planning an estate. Sylvia brings a diverse set of skills to the firm. She has an extensive administrative background that allows her to tactfully and efficiently serve a wide-array of clients. Her continued education in marketing and the technological world brings a dynamic quality to the firm. 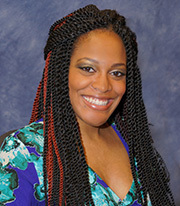 Sylvia has a Bachelor of Arts degree in Communications with a focus in Law and Community Advocacy from Arizona State University. She also studied Paralegal Studies at Chaffey College and is a Certified Paralegal. In addition to her legal background, she is also Certified in Web Design and Marketing.